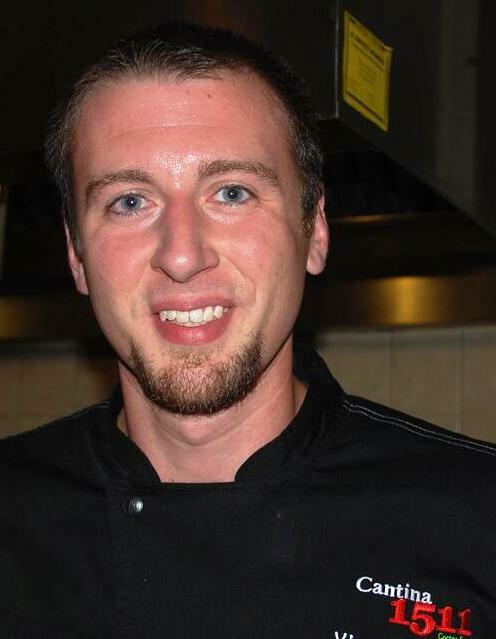 September 24 marked the date for Battle 8 of the Fire in the City Competition Dining. The last of the preliminary rounds of competition this night was between Chef Bruce Moffett of Barrington’s Restaurant and Chef Vincent Giancarlo of Cantina 1511. As always the chefs arrived at Bonterra Dining and Wine room around 11 or so to check out the kitchen and the well -stocked mobile pantry provided by Pate Dawson – Southern Foods specifically for the event. At noon they sat down with Competition Dining creator and host Jimmy Crippen to review the video presentation for the evening, go over the rules and learn the secret ingredient. 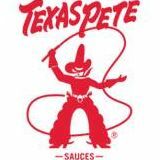 Turns out this last night of preliminary rounds belonged to North Carolina’s own Texas Pete! 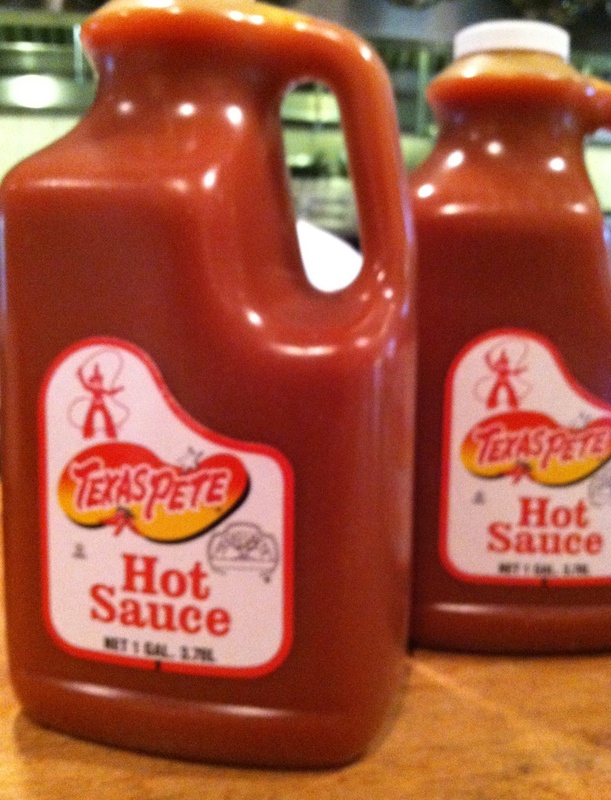 You may be wondering how is it that a tasty red pepper sauce made in North Carolina happens to be named Texas Pete? Well, legend has it that, when Sam Garner and his three sons, Thad, Ralph and Harold, were trying to come up with a name for this spicy new sauce they had created, a marketing advisor suggested the name ”Mexican Joe” to connote the piquant flavor reminiscent of the favorite foods of our neighbors to the south. But Sam wanted more of an all-American name and suggested the word “Texas”, a state that also had a reputation for spicy cuisine be used in the name. Then, he glanced at son Harold, whose nickname was ”Pete” and the Texas Pete cowboy was born. While it is interesting to look at now – nothing much about the story of Texas Pete mattered to the chefs from Barrington’s and Cantina last Tuesday morning. All that really mattered was that each team was told they had a minimum of 2 gallons of the full flavored hot sauce with which to work; and, in the end, present three different plates each to nearly 130 dinner guests. It was going to be a heated battle for sure. 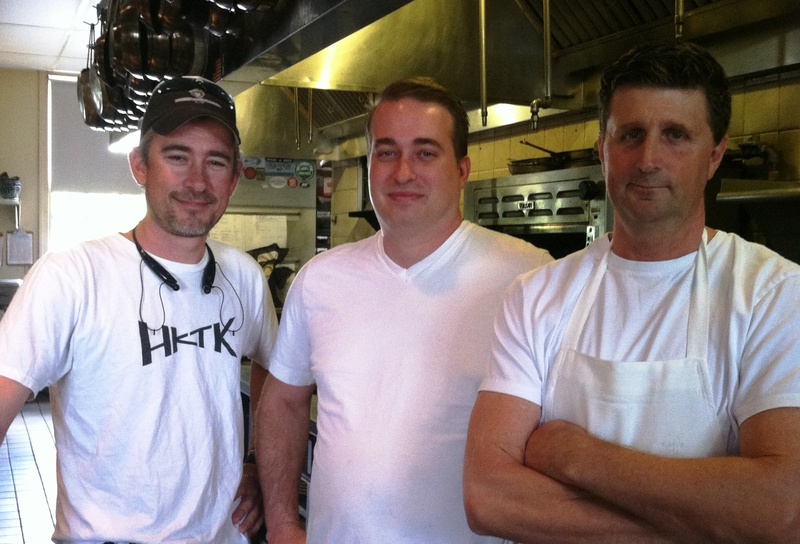 You could see the wheels in the heads of these chefs turning as they made plans for the short 6 hours they now had to prep and cook before the battle began. In this food writer’s opinion, the skill involved this night would be in using this secret ingredient to its full potential – underscoring the flavor of the sauce without over accentuating the sauce’s heat. 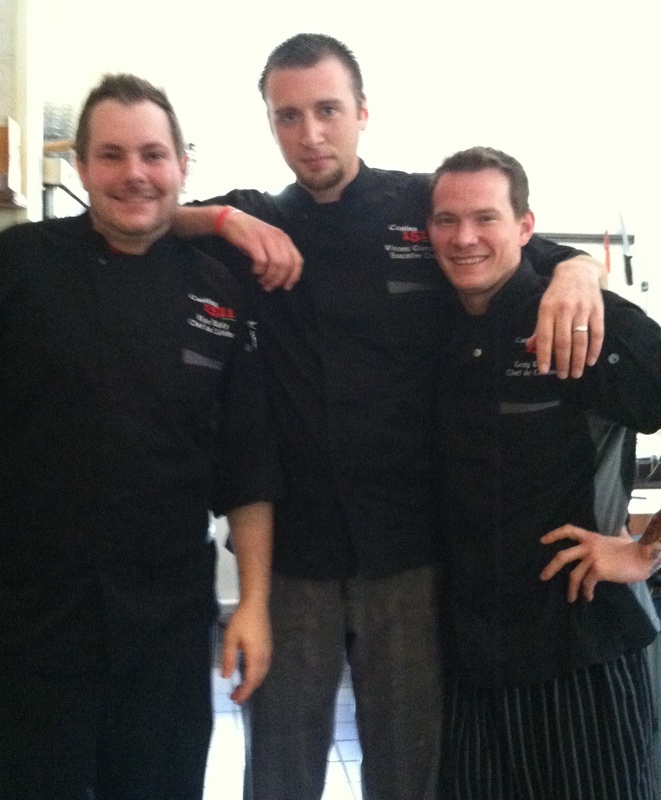 So how did the chefs prepare for this evening of Competition Dining? Cantina owner Ben Filmalter told me in advance of the battle, that for his team at Cantina 1511, it was like entering a David vs Goliath situation. They were definitely the underdogs going up against Moffett and his team from Barrington’s Restaurants, one of Charlotte’s most popular places to dine; the #1 Zagat-rated restaurant in Charlotte and one of AOLs top 11 restaurants in the country. The Cantina chefs prepared themselves with weekly meetings trying to anticipate secret ingredients and figure what they would do in a worst case situation aka – how do we make dessert if the secret ingredient is fish? After having attended an early battle, Filmalter offered his team the following advice: to keep dishes colorful and simple, keep descriptives easy to understand; and he said that he felt the dessert plate would most certainly be the make it or break it moment of the evening. As it turns out this last piece of advice was a very accurate prediction of things to come. Here is what happened as we, the collective dining audience, that night ate are way through six Texas Pete laced plates of sensational savory and sweet offerings. Course 1 was a delightful way to begin. 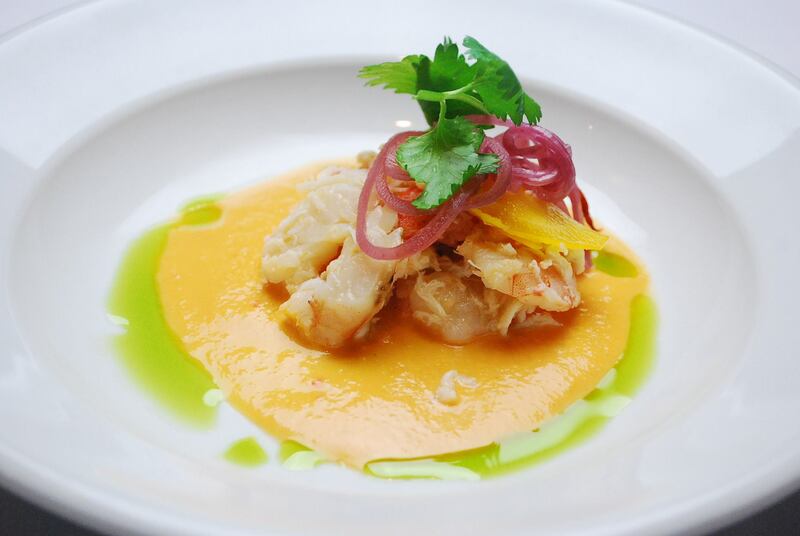 Chef Moffett’s Texas Pete® Marinated Ceviche of NC Shrimp Maine Lobster and Little River Lump Crab sat in a pool of pleasantly piquant Citrus-Tomato Gazpacho, and was topped with a Root Vegetable Salad and Cilantro. The plate was exceptionally well done – the flavor of the Texas Pete was there but understated enough to be noticed without overpowering the fresh taste of the seafood. Course 2 a starter from Chef Giancarlo was also delicious; but here the taste of the Texas Pete® used to Brine the Maple Leaf Farms Breast of Duck served with a Golden Beet Puree, Baby Arugula & Radish Salad, Texas Pete® Vinaigrette, and a Bing Cherry Gastrique was more understated. 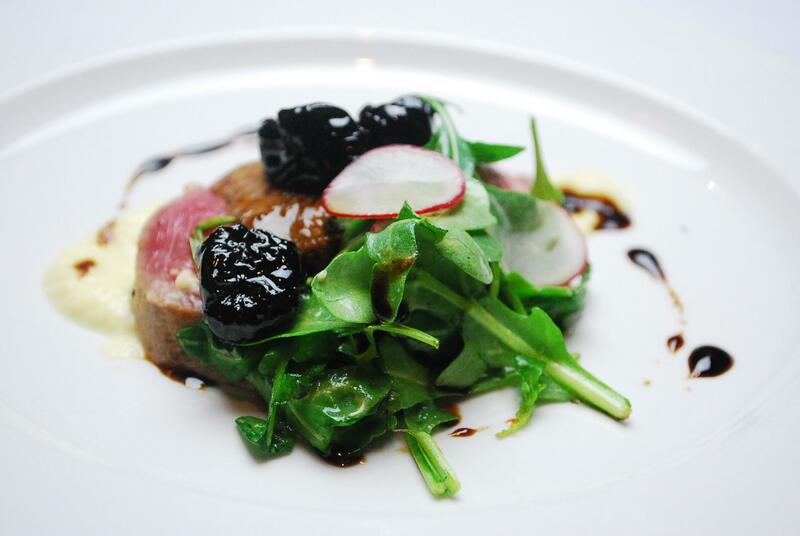 In fact, if Twitter posts during dinner are any sort of a read, it wasn’t the use of the Texas Pete at all, but the rich Bing Cherry Gastrique that made diners love this plate so much. 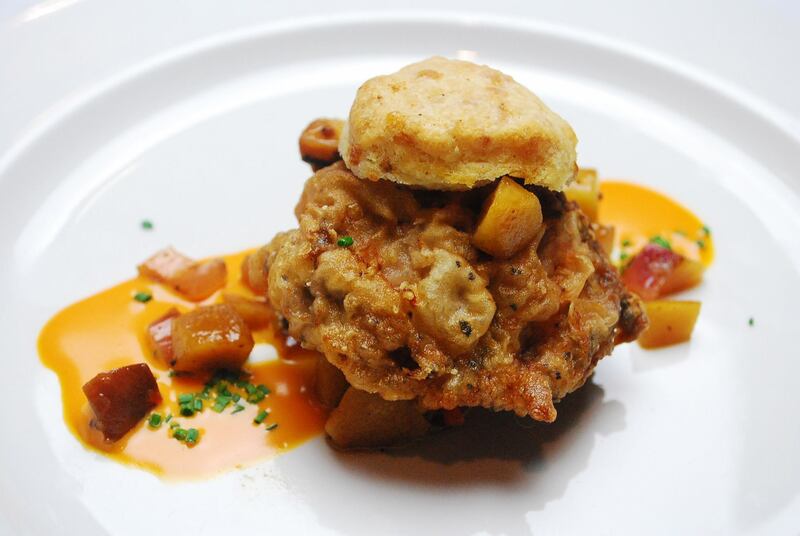 Course 3 was a beautifully presented Southern “sandwich” of sorts – Comprised of Manchester Farms Southern Fried Quail with Grilled NC Peach and Red Onion Salad and an Ashe County Bleu Cheese Biscuit, the plate was finished with a swirl of Texas Pete® Jus. Honestly Chef Moffett had me at the quail – this tiny breast was perfectly cooked, and along with the soft creamy taste of the blue cheese biscuit, the piquant peach and onion salad and the heat in the Texas Pete au jus, it was, for me, a sublime blending of taste and texture. I could have eaten several more. Course 4 was another crowd pleaser. 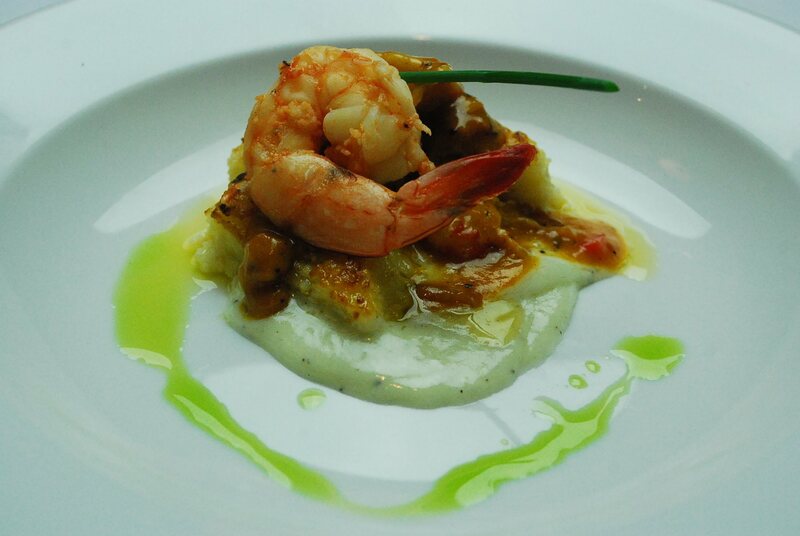 In this dish Chef Giancarlo’s Texas Pete® Poached NC Shrimp took center stage and they were packed with flavor. Supporting the spicy shrimp on the plate, a rather mild Andouille Étouffée and an excellent Caramelized Onion Grits Cake all atop a pool of Ashe County Bleu Cheese Fondue, garnished with a single Chive. Nicely done! Although no one knew it at the time, up until this point in the battle, the scores that divided the two chefs were very close. With a mere 8/10ths of a point between the two teams, the battle could have gone either way. Its the nature in a competition of any kind that some days there will be an upset. Culinary competitions are no exception -sometimes things just go wrong and you try to make the best of it. It happens to everyone despite reputation, credentials or accolades – sometimes soufflés don’t rise, ice creams don’t freeze and custards don’t set; and sometimes the other guy just out cooks you. 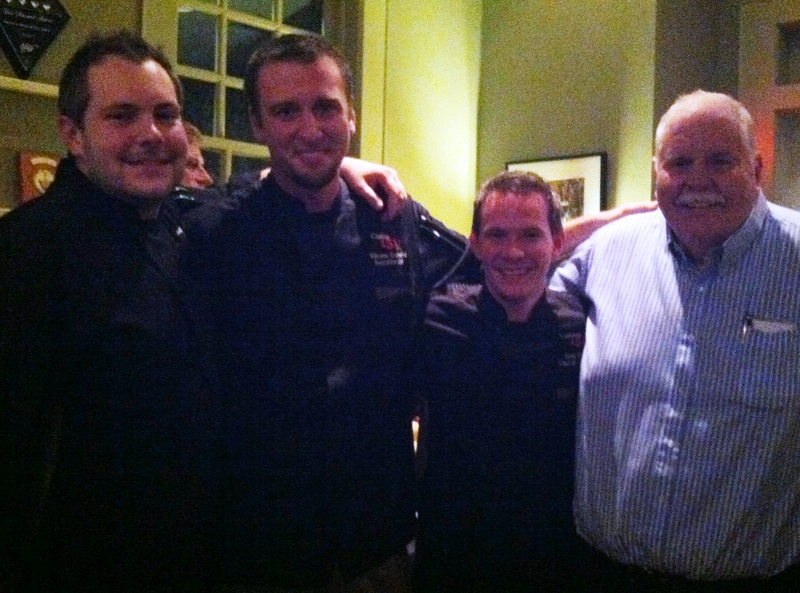 It is the nature of the beast and such was the case at the end of this night for Chef Vincent Giancarlo of Cantina 1511 and Chef Bruce Moffett of Barrington’s. 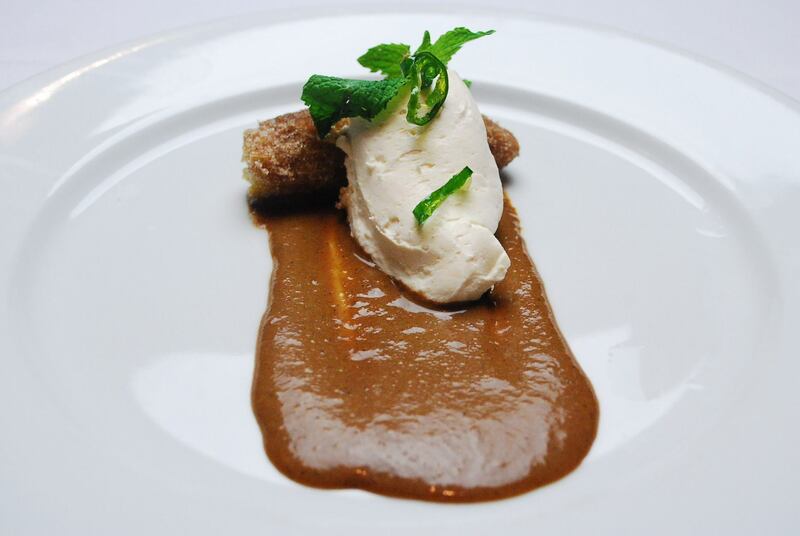 Course 5 was Moffett’s Mexican Texas Pete® Hot Chocolate Custard with Cinnamon Churros, topped with Candied Serrano Chili Pepper. 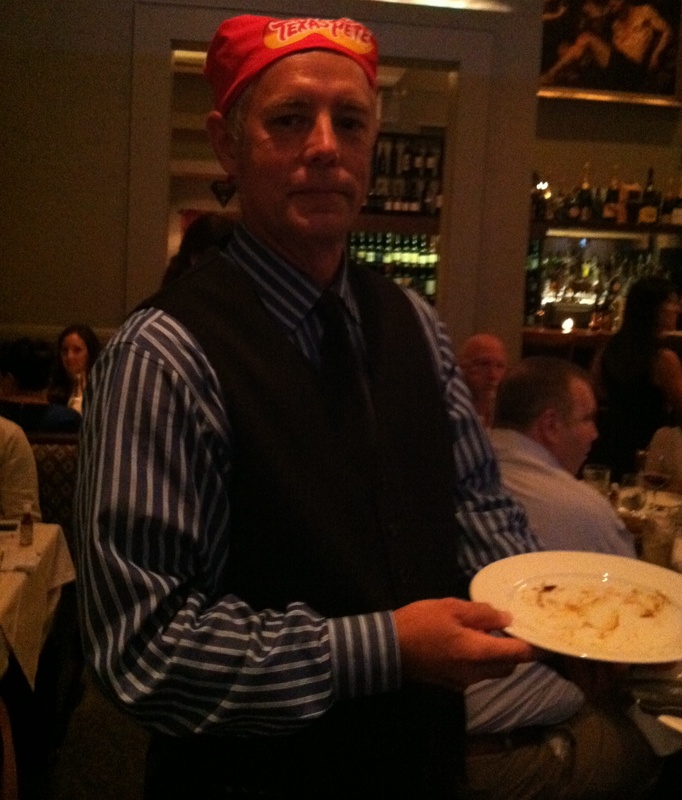 This is the dish that did Moffett in this night. For whatever reason, the custard didn’t set as it was intended; so it was presented as more of a thick sauce on the plate, served with two small bits of very tasty cinnamon churros and a quenelle of whipped cream with a sprig of mint; finished with several slices of candied Serrano. While the custard smelled wonderful and tasted good; presented in this way, there were too few churros on the plate in comparison; and honestly, it looked a hot mess. Add to that the fact that the candied serranos were more fiery than they were candied and you have a dessert that sadly just didn’t work. Had this custard set into a firm mass and been scooped in a quenelle alongside the whipped cream, the results of the evening might have been very different. Course 6 was Giancarlo’s dessert offering. The Texas Pete® Smoked Tomato Ice Cream was a very creative move for the Cantina team. But my honest assessment was that the texture was grainy – not smooth and creamy like an ice cream should be. Had I been voting, I would have taken big points off for that, but I must admit, the flavor was good and kept me coming back for more. My two cents? I think Giancarlo should take a slightly smaller portion of this frozen medley, call it a “frozen salsa” and serve it at Cantina 1511 in the same phyllo shell atop a slightly peppery bed of mixed greens alongside the Texas Pete shrimp from course four of this competition – a new bar bite , perhaps? 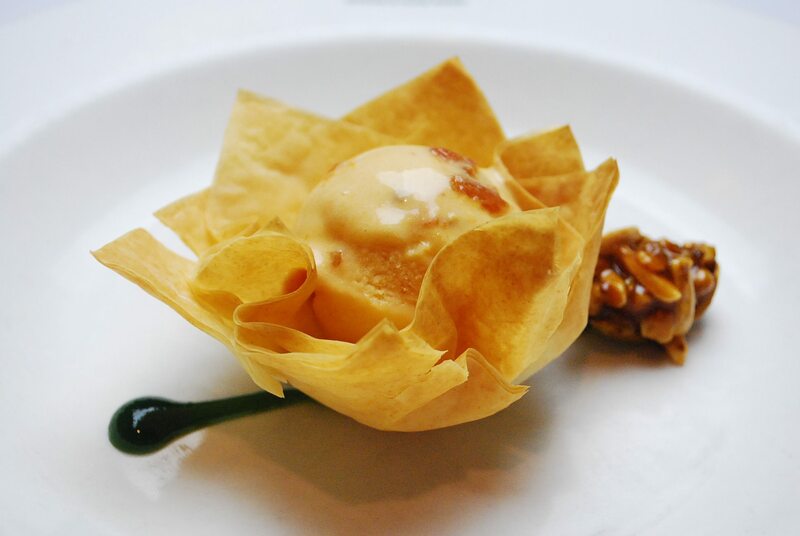 One must, however, give credit where credit is due; and this night, served in a crispy phyllo cup, the “ice cream” sat alongside a delicious Texas Pete® Mixed Nut Praline, and a tremendously flavorful Basil Syrup. The crowd loved the innovative effort and the flavor and as a result, its the dish that gave Giancarlo the lead. 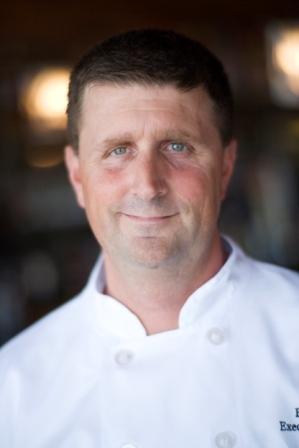 Congratulations go out to Chef Vincent Giancarlo and Team Cantina 1511 who now will go on to the quarter finals to battle Chef Luca Annunziata and Team Passion 8 Bistro on October 8.